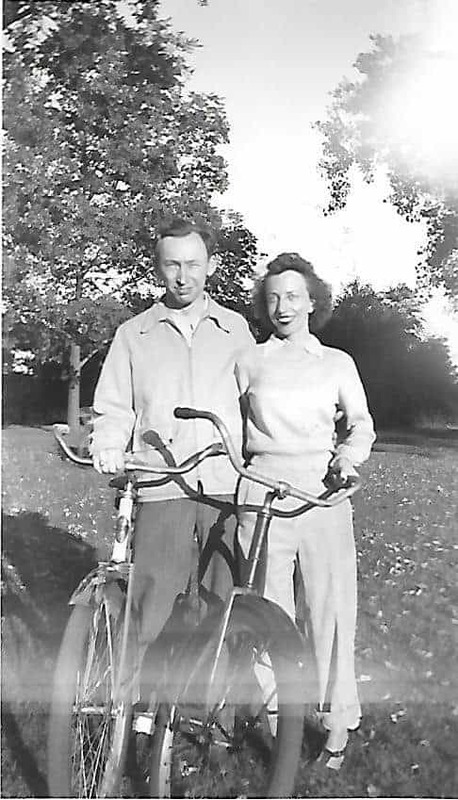 Bill and Elinor Henning enjoying a bike ride on a pleasant autumn day in Chicago, circa 1950 (aka 1 BD- Before David). For part of his military service in the army during World War II, my dad William (Bill) Henning was stationed at Red Bank, New Jersey. Due to its close proximity to Manhattan, Dad enjoyed occasional weekends there. On one of those visits, he struck up a friendship with my mother Elinor’s twin brother, Elmer. He served at the Navy Fleet Post Office there. Imagine Dad’s surprise when he ran into Elmer at the Lutheran Service Center, located at St. Luke’s Lutheran Church in New York City. Because Elmer wasn’t alone. That weekend Elinor came up from Washington, D. C., where she worked for the Navy Department, to see Elmer and his wife Clara. 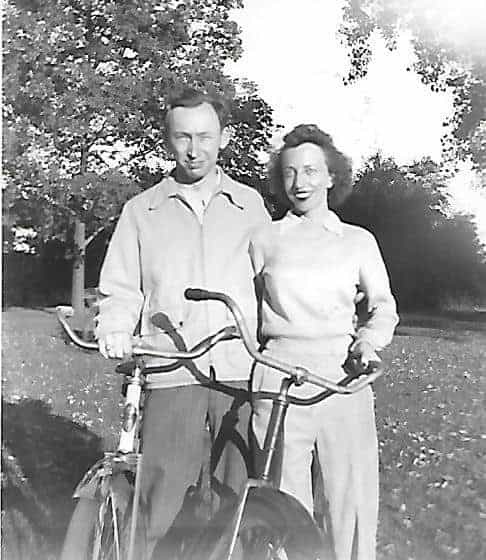 Bill and Elinor next met “by chance,” as Mom put it, after the war at Elmer’s home in Milwaukee. Mom stopped in Milwaukee on her way back to Chicago from her vacation in Colorado. Since taking a job with United Airlines, she now lived in Chicago. While Mom was there, Dad traveled from his native Chicago to visit Elmer. After a year and a half of dating, they married. In the seventh century John Climacus, a Egyptian Christian monk renowned for leading people to deeper levels of Christlikeness, advised: “Fight to escape from your cleverness. If you do, then you will find salvation and uprightness through Jesus Christ our Lord.” Thus, Climacus identified one of the greatest barriers to experiencing Christ’s presence and power in our lives. That barrier consists of our need to completely figure God out in advance of what He’s doing. This represents our attempt to control Him and predict His next move. Throughout his life seasons, Dad walked on holy ground as fiancé, husband, father, chemist, provider. To sustain his journey he, like all of us, needed only one thing- the favor of the Lord. As a result, like the great men and women of the Bible, seek the favor of the Lord before anything you do. With God’s favor, Brian exhorts, victory’s ensured. Without it, you’ve already lost the battle. Boy. That is great advice. “Escape from all your cleverness”. Makes perfect sense that doing THAT would take God out of the picture. That is probably what’s wrong with the younger generation. It might be labeled as Narcissism. Yes. Seek God in everything you (we) do. We may not like His answer but we will find Him.